The Jenway 6320D visible range spectrophotometer has a dome shaped lid to accommodate both standard cuvettes and test tubes commonly used in water quality analysis. This is an ideal unit for colleges, university teaching laboratories, QC and testing procedures such as water quality analysis and also many applications in industry. 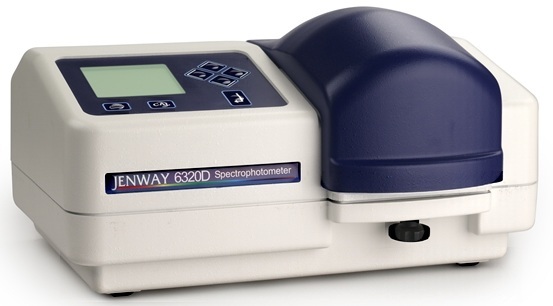 The Jenway 6320D Spectrophotometers are robustly built and have a small footprint, to make efficient use of laboratory space. Wavelength range of 320 to 1000 nm with 1 nm resolution, ± 2 nm accuracy and 8 nm bandwidth.